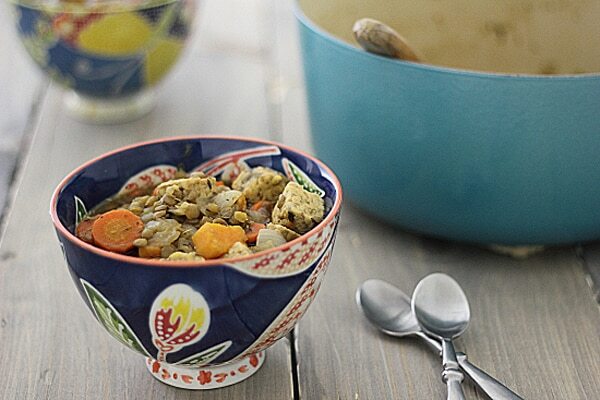 Vegetarian Irish Stew was one of the first recipes I published on my blog. I posted it on St. Patrick’s Day, in honor of my Grandpa’s birthday. I’m not really sure if he understood this whole blogging thing that I had just undertaken, and he certainly had no idea what tempeh was, but my Grandma told me she read the post out loud to him and I hoped that it made him smile, tempeh and all. I’m on my way to Chicago today to say good-bye to my Grandpa; he passed away on Friday. He had been in failing health for a few years now, but even though this wasn’t unexpected, his death has hit me hard. My Grandpa taught me the value of hard work, the power of a simple kind gesture, and the importance of taking time for others. I wish I had learned to have patience from him too–I’ll keep working on that one, Grandpa. I already had posts written and scheduled for this week, so those will still be running, although I won’t be around to respond to comments or answer questions. It’s been a difficult few weeks for my husband and me, with his grandfather’s death two weeks ago and now my grandfather passing away too and I have truly appreciated all the comments and emails I have received–thank you. Oh, and here’s the link to that Vegetarian Irish Stew recipe. I’ll be making it again this St. Patrick’s Day and remembering all the corned beef and cabbage dinners we used to have every year for my Grandpa’s birthday. Such a heartbreaking (and yet beautiful) post. I’m so sorry for your lost, Kiersten! You’re in my thoughts and prayers. I am very sorry about your grandfather. It is so hard to lose a loved one. I hope you have lots of family around to share happy memories. This is probably not a good time to tell you how much I love your blog. I just found it tonight and have been on it for two hours. I bought a book today and it has got me thinking I could/should do this vegetarian thing. The book is The Kind Diet by alicia Silverstone. I’ve been speed reading. Good stuff. The problem is I’m a cook. I cook dinner every night and entertain a fair amount. Not one person in my family, or one close friend is a vegetarian, much less vegan. We grill out a lot in the summer…it’s a way of life. Yet, I want to try this. I want to feel better, have more energy, bet responsible for doing something good for whole. So thank you for sharing what you eat every week. It gives me ideas…hope. Thank you so much. Thank you for your kind words! I’m sure cooking vegetarian meals will be an adjustment for you, but once you learn how to do it, I think you’ll find that it’s a lot easier than cooking with meat. Tomorrow I’m publishing a post about how to make any (well, almost any!) recipe meatless, so that might give you some ideas. It’s definitely doable–good luck! Well, crap. I’m so sorry to hear about another loss in your family. He sounds like he was a stellar guy and you were lucky to know him (and vice versa). Big hugs to you. I’m so sorry for your double loss. Family tribute posts are the sweetest, and so are grandpas. You’ve had a tough few months. 🙁 Hoping things only look up from here. What a sweet tribute to your grandpa. I’m thinking about you hun and I hope you’re well. My deepest sympathy to you and you husbands loss. My God give you comfort during this time. I’m so sorry for your loss. It does sound like it’s been an awful couple of weeks. Big hugs!